Freeze martini glasses for 1/2 hour. Remove from freezer, swirl chocolate sauce in the glass. 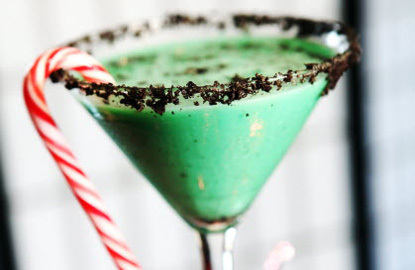 Add 3 ice cubes, creme de menthe and Godiva liqueur to mixer. Shake and pour into martini glass. Add any garnish of your choice. If you prefer a frozen drink. Mix ingredients in a blender and blend on crush cycle until smooth. Pour into glass and add garnish. 2 comments on "Celebrating Mint-- White Chocolate Mintini"